Peruvian Walnut (Juglans neotropica) is very similar to American Walnut but it’s difficult to work because it’s very prone to splintering and tears out. However, it takes an incredible finish and it’s grain is very pretty. The wood I used to make these pens were off-cuts from a dining table I built for friends a few years ago. Mechanism: Cross style and refills are readily available in most office supply stores. Finish: The pens were sanded up to 400 grit, then burnished with 0000 steel wool to bring up a smooth surface. It was then finished with mineral oil, bee’s & carnauba wax and a final polish with paraffin wax. 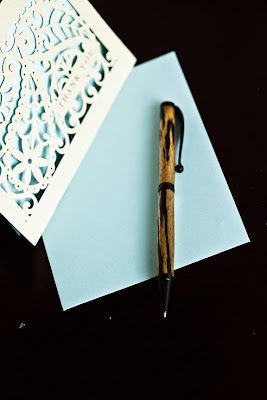 This pen is made from Mpingo (Dalbergia melanoxylon) commonly known as African Blackwood. Some folks like a thicker barrel on their pens, so I turned this one to a larger diameter than I usually do. The extra wood gives the pen a bit more heft, so it feels nice in your hand. This pen I turned to a slimmer profile than the one listed above, but it still has the lovely subtle red undertones in the grain. I’m quite pleased with this particular pen, and I think you will be too. I made another pen from a once-fired .50 caliber BMG (Browning Machine Gun) shell casing, this time with Mpingo (African Blackwood). It is the pen in the right in the above photo. Making these pens is kind of fun. There’s only one barrel to be turned and there are only a couple of tricky spots. I made the barrel on this pen a bit longer to give it more weight at the tip for counter balancing the heft of the shell casing at the other end. Mpingo is one of the heavier woods I work with, so the extra weight helps. The photo collage below shows the dramatic variations of the sap & heart wood grain as well as the striking differences in colors from dark black with some subtle reds of the heart wood to the creamy yellowish white of the sap wood. Finish: The wood was sanded to 400 grit then polished up to 0000 steel wool. A wax & oil finish was then applied. The brass shell casing was sanded to 800 wet & dry, then up through 0000 steel wool, and finally polished with silver polish to a soft luster, then given three coats of gloss lacquer to preserve the shine. Since these are once-fired brass, there are dings & scuffs from the firing, extraction and collecting processes. These pens are made from Black & White Ebony (Diospyros embryopteris) which is also known as Pale Moon Ebony or White Ebony. There are so many species of Ebony in the world that it’s sometimes difficult to classify what you’re working with, but I’m pretty sure this is correct. I bought the wood from a woodcraft store that offers off-cuts from custom shops. Mechanism: The mechanisms are all Cross style and refills are readily available in most office supply stores. Another pen from Black and White Ebony with gun metal gray mechanism. A third Black and White Ebony pen in black livery. Mpingo (African Blackwood) has quickly become one of my favorite woods to work with. It machines well, smells nice, isn’t grumpy on the lathe – meaning it doesn’t split or crack easily although it will if you try hard enough. This particular piece said “bottle stopper” to me as soon as I saw it. The cut off wasn’t big enough to do much else with. It wasn’t long enough to make a pen from but it was long & wide enough to fit into your hand nicely. I like how the two colors have such a distinct line between two such highly contrasting colors. On the chrome steel part, there are two O-rings along the taper to help seal most wine bottles. It also fits perfectly on bottles for storing oil, honey and the likes while adding a striking look to your kitchen counter or dining table. Materials: Mpingo wood, chrome steel, silicone O-rings. Finish: Sanded to 400 grit, then 00 through 0000 steel wool. Status: Sold but a similar one may be available. Click here to inquire. These two pens are made from Alder (Alnus rubr) harvested from a friend’s swamp he was trying to reclaim. I probably pulled close to three cords of it out of the mud and blackberries on his back forty. Although it’s technically a hardwood, Alder is very soft and surprisingly difficult to turn at the pen scale. However, it’s pleasant wood to work with, it smells nice and you can use the sawdust to smoke meat on your grill. Mechanism: Cross style, and refills are readily available in most office supply stores. Status: Gifted but similar pens may be available. Click here to inquire.